Here are a few other program updates not included elsewhere in this newsletter. To get real-time news and analysis from Breast Cancer Action, be sure to sign up for our email list, and follow us on Facebook and Twitter. Barbara Brenner, Breast Cancer Action’s executive director for 15 years, was a powerful advocate for women living with and at risk of breast cancer. 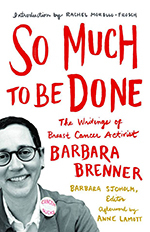 Her recently published posthumous collection of writings, So Much to Be Done: The Writings of Breast Cancer Activist Barbara Brenner, edited by Barbara Sjoholm, form a chronicle of breast cancer research and healthcare activism that is as inspiring as it is informative. Since the book was published, members have hosted book launch events across the U.S. and in several other countries. You can buy the book here. Breast Cancer Action is one of very few health organizations that refuse corporate funding from pharmaceutical companies. Because of our strict conflict of interest policy, we can be an unbiased and independent watchdog for your health. We always evaluate and report on developments in breast cancer treatment and screening from a patient-centered perspective. All year long, we’re monitoring developments and news in breast cancer treatment, screening, and diagnostics; here’s a quick update on some important breast cancer issues. In June, a study published in the New England Journal of Medicine evaluated the efficacy of extending the treatment of letrozole from five to ten years for women with hormone positive breast cancer. On our blog, I discussed the trade-offs of ten years of aromatase inhibitors. This fall, new research also published in the New England Journal of Medicine showed that a large percentage of women with early-stage breast cancer who have been identified as having a high risk of recurrence can consider forgoing chemotherapy based on the biological makeup of their tumor. I discussed this new research with the San Francisco Chronicle and KQED. If you weren’t able to attend our recent webinar on the Lymphedema Treatment Act, you can watch it on our website here. Medicare and other insurance companies don’t currently cover the costs of lymphedema treatments, leaving patients who can’t afford them to suffer with this debilitating condition. We’re working with our partners the Lymphedema Advocacy Group to end this injustice. Write letters to your Congressmembers here to tell them to co-sponsor the Act. If you haven’t read or downloaded it yet, don’t miss our patient-centered, evidence-based brochure, “Should I Get a Mammogram?” Understanding the Harms and Benefits of Routine Breast Cancer Screening. 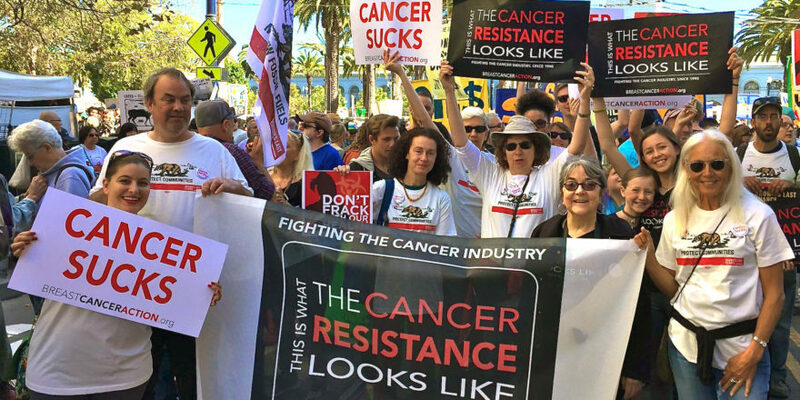 A few years ago, we were the first—and remain the only—national breast cancer organization to take a strong and public stand against dangerous drilling for oil and gas, including fracking, because the practice exposes people to endocrine disruptors and carcinogenic chemicals that are linked to breast cancer. In July, we marched with 10,000+ people at the Democratic National Convention in Philadelphia to demand an end to fracking and other forms of dangerous drilling. People from all over the country—and even some from around the world—marched for a clean energy revolution, while more than 900 organizations from all 50 states endorsed the action. This massive outpouring shows that we have the people power to end these harmful processes. Amidst all the action, we carried your voices loud and proud. 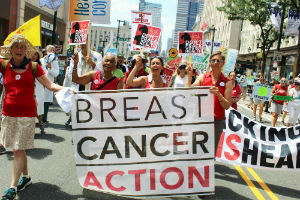 At the march, BCAction members joined us in calling for an end to toxic energy sources that use chemicals linked to breast cancer. And as the leader of the health contingent for the march, health professionals also joined us in the streets to tell our political leaders: “Stop protecting fracking wealth! Start protecting public health!” The march ended with a powerful rally, where our executive director Karuna Jaggar spoke to the crowd about why we, as a breast cancer organization, were taking action. Whether you came out and marched with us, or you support our work in other ways, we thank you. Because of you, we had a huge presence at the march and continue to play a critical role in this strong anti-fracking movement. “Fracking”—an issue that, just several years ago, was considered fringe, made its way into presidential debates and drew its largest opposition of 10,000 in July. And recent polls show that the majority of Americans are opposed to fracking. In August, we joined our partners in delivering over 350,000 signatures to California Governor Jerry Brown, telling him to stop allowing our nation’s food to be watered with toxic oil wastewater. Even if you don’t live in California, you eat California crops. The state grows a bulk of the nation’s produce. At the same time, California is the third largest oil-producing state in the country—and it’s in a multi-year drought. Oil companies use hundreds of chemical additives during the oil extraction process—to drill, maintain and clean their wells. In addition, the oil extraction process releases chemicals that are trapped underground. So when oil is extracted from underground reservoirs, wastewater comes back up with it and can contain all sorts of chemicals. Using oil wastewater to irrigate our food has not been proven safe—neither for the health of the public nor for the health of farm workers, who are exposed firsthand to these chemicals. Plans are underway to expand the use of oil wastewater for crop irrigation in the state, so now’s the time to take a strong stand against this terrible practice.